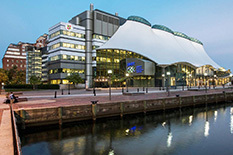 Pictured: The Columbus Center, located in Baltimore's Inner Harbor and home to the Institute for Marine and Environmental Technology (IMET), where Baltimore Entrepreneur Office Hours are hosted. Innovators and entrepreneurs in Baltimore will have a new place to go for free, expert advice on launching their own companies or bringing their inventions to market every month starting on September 16 at the Columbus Center in Baltimore. The Maryland Technology Enterprise Institute (Mtech) and the Institute for Marine and Environmental Technology (IMET) are partnering with representatives from the greater Baltimore entrepreneurship community to offer free, open Baltimore Entrepreneur Office Hours on the third Tuesday of each month. Interested entrepreneurs and innovators can walk in, or reserve a slot online at www.eoh.umd.edu/Baltimore.html. These services, offered to the entire Baltimore community, are modeled after Mtech's Entrepreneur Office Hours at the University of Maryland, through which more than 1,000 entrepreneurs have received assistance since 2007. "We are excited to partner with Mtech Baltimore Director Martha Connolly and Mtech Ventures Director Craig Dye to bring the institute's expertise, along with business and legal professionals in the region, to cultivate the flourishing entrepreneurship ecosystem in Baltimore," said Russell Hill, Director of IMET. "Baltimore Entrepreneur Office Hours are a great first step for current or aspiring entrepreneurs to receive free and impartial advice, brainstorm business strategies, investigate funding opportunities and learn about additional resources available to entrepreneurs." "Mtech is enthusiastic about the opportunity of bringing entrepreneur office hours to Baltimore," said Peter Sandborn, Director of Mtech. "We have found this service to be an effective way of supporting our own entrepreneurial community by providing them with free access to proven experts, along with connections to the vast resources available to them in the State of Maryland. We look forward to getting to know the thriving entrepreneurship community in Baltimore." Baltimore Entrepreneur Office Hours are open and free to any interested innovators or entrepreneurs in the greater Baltimore region. Participants can walk in or reserve a slot online at www.eoh.umd.edu/Baltimore.html.